5-1/2 Award Trophy | Hodges Badge Co.
5-1/2” award trophy lets you choose any Trophy Top we offer (90+ tops) to suit your event. 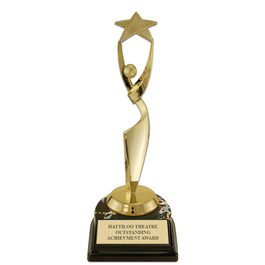 Trophy features a black horseshoe shaped base with engraved plate, where you are also able to personalize each Award Trophy with 4 lines of text FREE of charge. Pricing is quantity based. The more you buy, the more you save!